Joy, a wonderful writer and author of the blog, Tales of Eneana, has nominated me to participate in a challenge to share a post about being Thankful. I am thankful for so many things, which includes the obvious: being alive, having a home to live in and good food to eat. So, along with these basic needs, this is my thankful list. 2. Having relatively good health. 4. Having the horrible days of my severe depression illness being in my past, not in my present and hopefully not in my future. 6. The wisdom of I have learned and earned during my life. 7. My little pet companion, Bria. 8. All the amazing people I have met on WordPress and the friendships that have developed. 9. Blogging on WordPress and interacting with all the wonderful people. 10. Those who participate in the flash fiction challenge that I host, Flash Fiction for Aspiring Writers. Of course, there are so many more that are not on this list. 2. Write about 5 people in your life you are thankful for. 3. 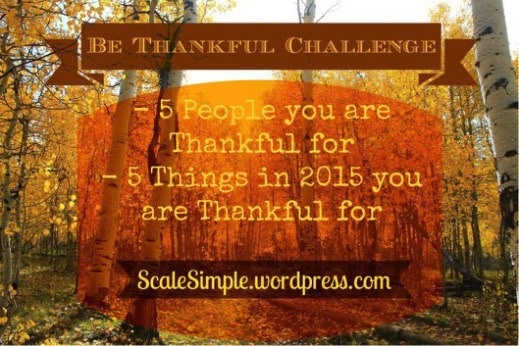 Write about 5 things in 2015 that you are thankful for. 4. Share the love and challenge 5 other blogs to participate. I am suppose to nominate five people to take part in this challenge but instead of nominating any particular person/blog, I am nominating you – the reader – to share what you are thankful for and if you wish, nominate five people to share their “thankful” list. I hope you will take a moment and share your gratitude with others. That’s wonderful Madeeha! I would love to read yours. What a wonderful list, Joy! I know what you mean, once I started thinking about what to put on my own list, I thought of so many more things than I first realized — what a wonderful feeling. And I also hope that your depression stays in the past and does not rear its ugly head again (for you and me both). Also, I’m sure I speak for all the participants of the FFfAW when I say that WE are so THANKFUL to YOU for hosting it! We literally(!!) couldn’t do it without you! Awww, I smiled when I got to “the FFFAW participants”. It’s true, there are always so many more to be thankful for. Thank you Ameena. 🙂 !! Yes, I have much to be thankful for! It is! Simple things. 🙂 Thank you for reading! 🙂 It works better too. Even if I don’t get back to sleep I find myself smiling…. Very lovely post and a list of such nice things! thanks for remembering these things in life and reminding us! I’m so glad you found the FFfAW! You have brought so much to the group! I’m happy to hear you are participating in NaNoWriMo and writing a novel! That is wonderful! I’m so glad you found FFfAW Challenge because you have brought so much joy to the group along with wonderful stories. I am happy to hear you are writing a novel and participating in NaNoWriMo! I wish you the best of luck!